Black and White video output?? If you encounter any problems with your CD-i system or have difficulty operating some software for CD-i then post your problems here. With help from the CD-i community and the vast resources hosted on the CDinteractive network we should be able to solve any trouble your experiencing. I couldn't get any video to work on my plasma tv so I just hooked it up to the older square tv. it's hd compatible but i'm just connecting it via the yellow/red/white wires. I'm using an NTSC tv as I'm living it up in Canada. Thanks so much if anyone can help me with this... very excited to get using this thing! I'm afraid the difference is because of the PAL / NTSC mismatch, at least that's usually what we get in Europe if you connect NTSC equipment to PAL-only displays. But a lot of modern displays are dual-standard nowadays. I'll find the manual for my plasma tv and hope for the best... i tried hooking it up again to the plasma but it still gets no signal. Could I maybe have to enable 16X9 before hooking it up? I mean if I enable 16X9 on the suqare tv (in black and white) and then try again with the plasma? Well, I'll give it a shot in the morning... I'm defeated for the day. Thanks again for the help. This seems like a really friendly place. 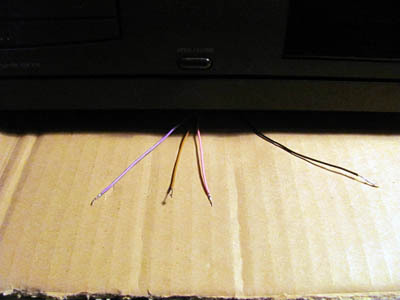 The CD-i 16x9 setting, as far as I know, only toggles a single signal in the SCART (euroconnector) output of your player, it does not change the video signal in any way. Yeah I'd never seen one of those euroconnectors before getting this cd-i. There's another tv in the next room but it's usually being used for crappy shows. But if I get a chance I'll try it out on tv number 3 haha. This final TV i have is a 54" plasma... it's the newest and best in the house. It's not my last hope, i'm still pretty happy just that the machine works as well as it does! Worst case scenario, play some games in black and white I guess. So basically you'll have to research that yourself and no guarantees that it will work . That would convert the modulation type, but probably not the timing. Intressting, can you post a picture of the Chip MOD/Switch? I fix Timekeepers and noisy/faulty disc trays/readers. Looking for a complete games list of the CD-i. Wow yeah that would be great if I could just configure some jumpers! Thanks again for all the help guys. notHuman wrote: Wow yeah that would be great if I could just configure some jumpers! No, that would not be the case. You'd have to do some soldering and most likely replace a crystal. Now for someone to open up his cd-i player and make a picture of the board inside. - pin 18 (PD1) pullup (3272) is labeled "ONLY FOR DISPLAY CDI 220"
- pin 18 (PD1) pulldown (3273) is labeled "ONLY FOR DISPLAY CDI 210"
- pin 58 (PC7) pullup (3203) is labeled "ONLY FOR NTSC"
- pin 58 (PC7) pulldown (3204) is labeled "ONLY FOR PAL"
The IKAT processor is the MC68HC0518 (7201). It is a smaller square chip close to the large square 68070 cpu (7210). I opened up one of my 210/40 players (I turned out to have two!) and performed the soldering. The full picture series can be seen here. 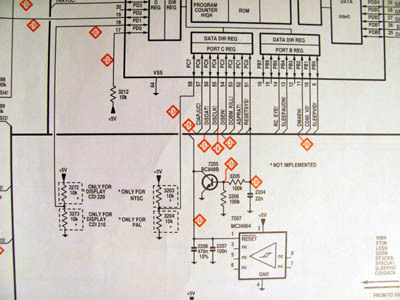 Service manual cutout showing the two resistor pairs. The four new wires (+5V, GND, PD1, PD7). I still need to obtain and connect two 10k resistors and two switches. Now for the interesting question: did it work? At least for the PAL/NTSC switch it seems to: the composite output will now display gray on my PAL TV, which usually indicates NTSC, and the software runs in 240 lines / 60 Hz mode as expected. Note that the euroconnector (SCART) output still displays color, but that is to be expected as it includes component video signals. My player does not have a Y/C output so I cannot test that. I have so far not seen any differences resulting from the 210/220 switch. According to the service manual, the main board should be identical between the 210/40 and 220/60 players. There may be some differences between the physical layout of the players, of course. 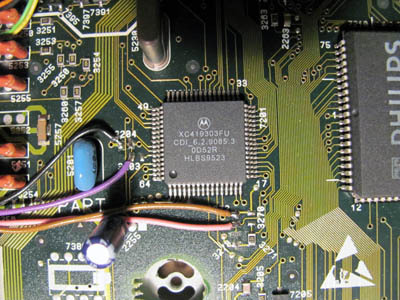 To perform this procedure you will need a set of TORX (Philips) screwdrivers and electronics soldering tools, but the procedure is not complicated although it requires a bit of care. Edit: Fixed the picture series link. Last edited by cdifan on Sat Oct 15, 2011 4:04 pm, edited 1 time in total. Ah nice man! Thanks for sharing. Though, the picture series URL doesn't work. I was opening up a 470/20 today, to fix some things. The Timekeeper, and CD drive noise. But, I also have a 210 (boxed ) here, to try this video output mod. Adr990 wrote: Though, the picture series URL doesn't work. Adr990 wrote: But, I also have a 210 (boxed ) here, to try this video output mod. Note that only the 210/40-/59 and 220/60-/79 players have this exact main board, for others the circuit diagrams and/or the board layout may not match. They may allow a comparable mod, of course.